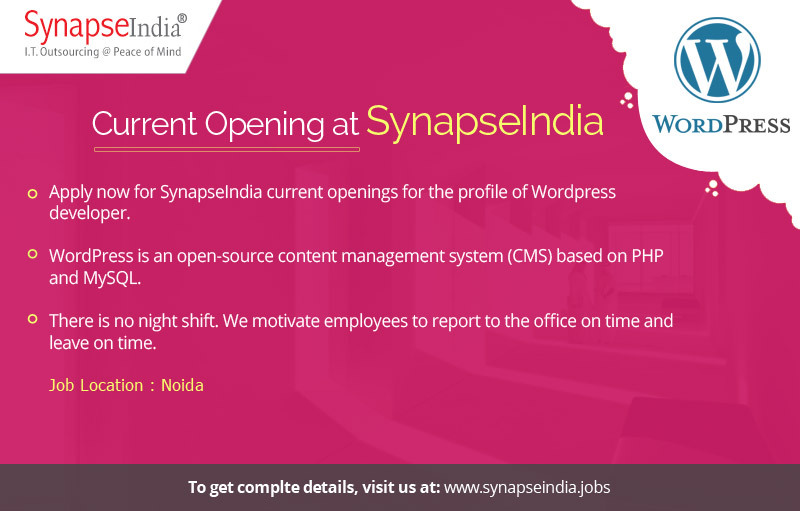 Apply now for SynapseIndia current openings for the profile of WordPress developer. WordPress is an open-source content management system (CMS) based on PHP and MySQL. Shamit Khemka, CEO of SynapseIndia, says “WordPress is very easy to use and has an intuitive interface. Adding new pages, blog posts, images, etc. on a regular basis can be done quickly and easily. Since the technology is very simple, time spent on formatting is greatly reduced. We have a team of skilled professionals that brings along with them lot of experience in all modern day technologies. We have also successfully delivered multiple projects on WordPress Development to clients globally.